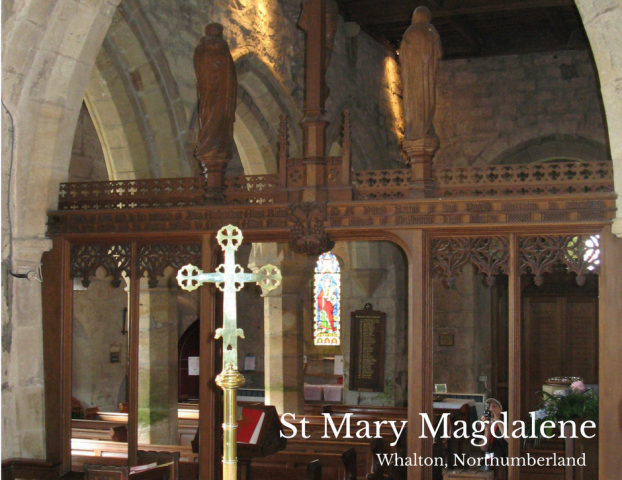 St. Mary Magdalene was built around the year 1100 only a few years after the Norman conquest of England, although extensions and modifications have taken place over the centuries since. 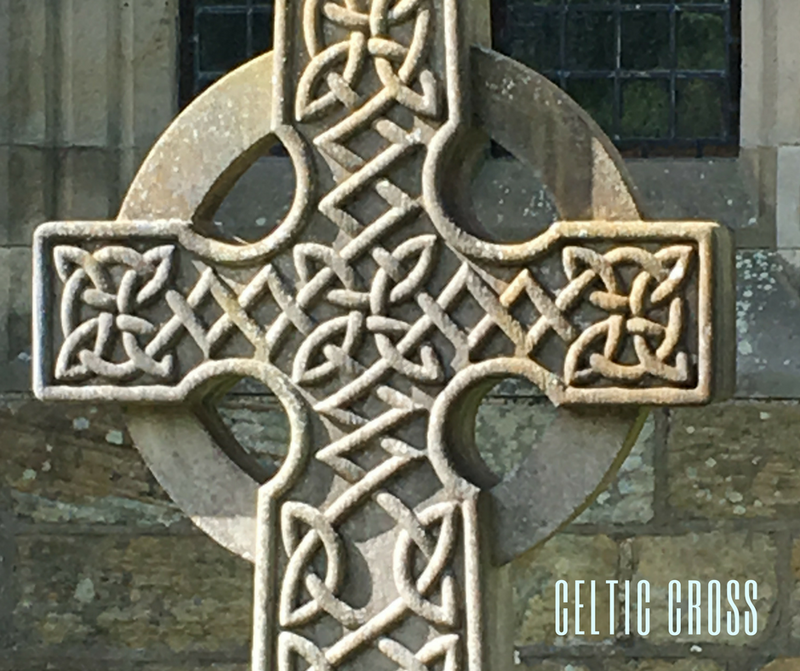 The Ogles had controlled the area and other places within Northumberland even before the Norman Conquest and they were one of a very few Saxon families that were allowed to keep their lands following the conquest. Imagine the numerous generations that have used the church – Elizabethans with ruffs around their necks, Georgian gentlemen doffing their tricorn hats on entering, Victorians in the clothing styles of their day – and think of the thousands of celebratory services that have taken place over the centuries – baptisms, weddings, national occasions, harvest, Christmas, Easter. 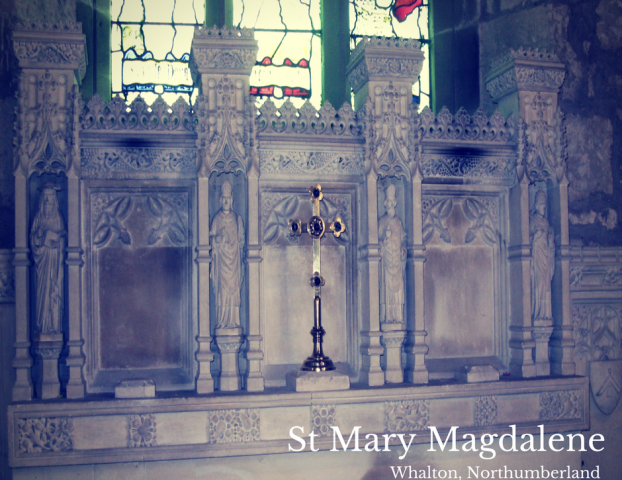 To the north of the altar is the Ogle chapel with its burial vault below and Ogle memorials on its walls. 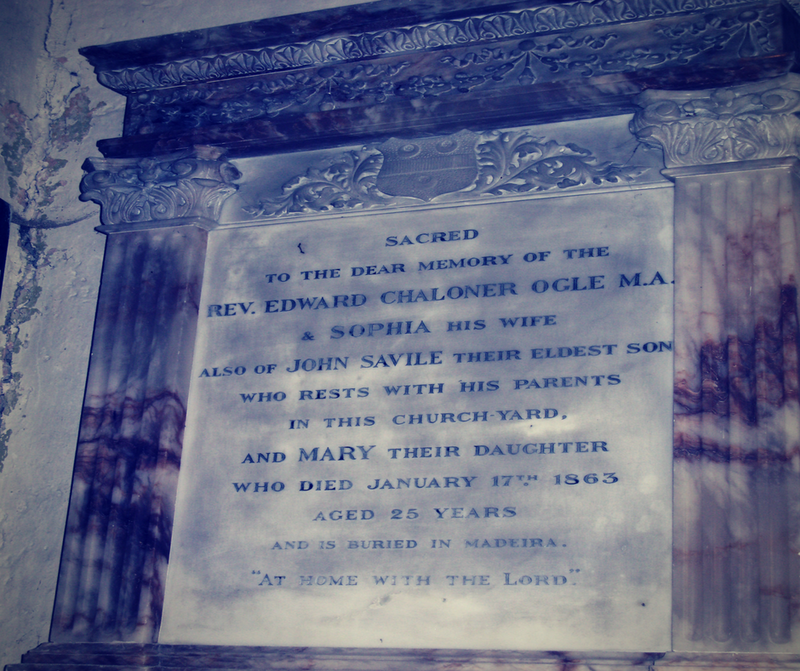 One of particular note describes the sad story of John Ogle who died aged only thirty-two in 1831, fifteen months after the death of his young wife in childbirth. 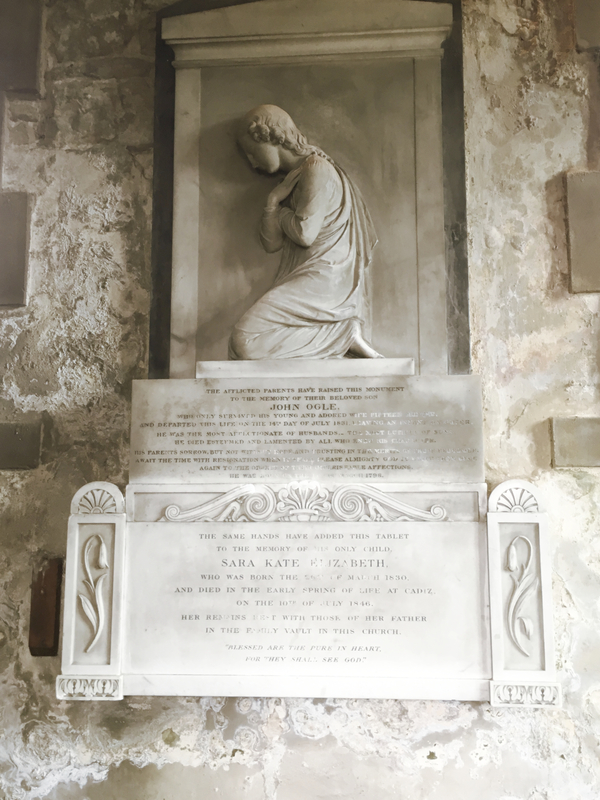 The baby girl survived only to die in Spain aged only sixteen. This memorial was sculpted by a London firm that later sculpted the statue of Horatio Nelson that is atop Nelson’s column in London. On the chapel floor are interesting ledger stones. 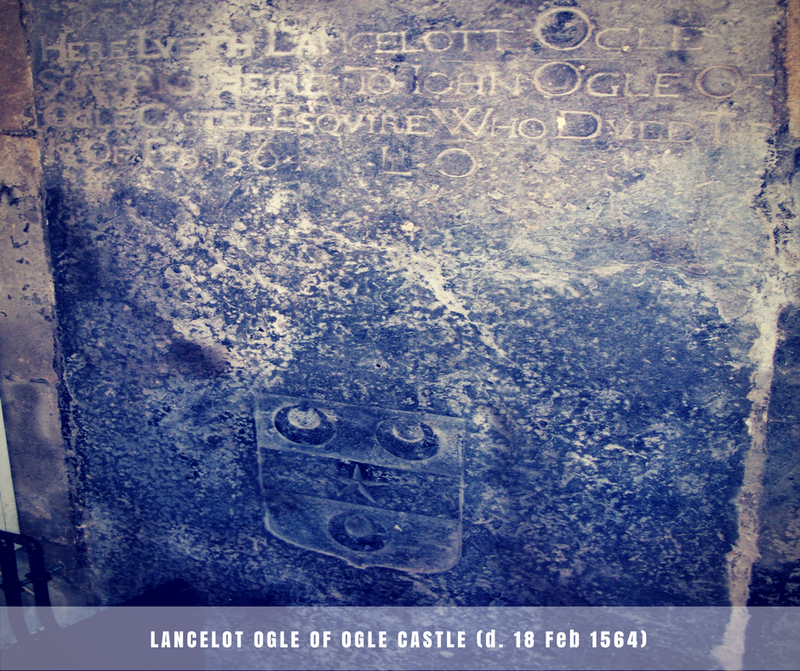 One marks the burial of Lancelot Ogle in 1564 which is the oldest dated gravestone in Northumberland. 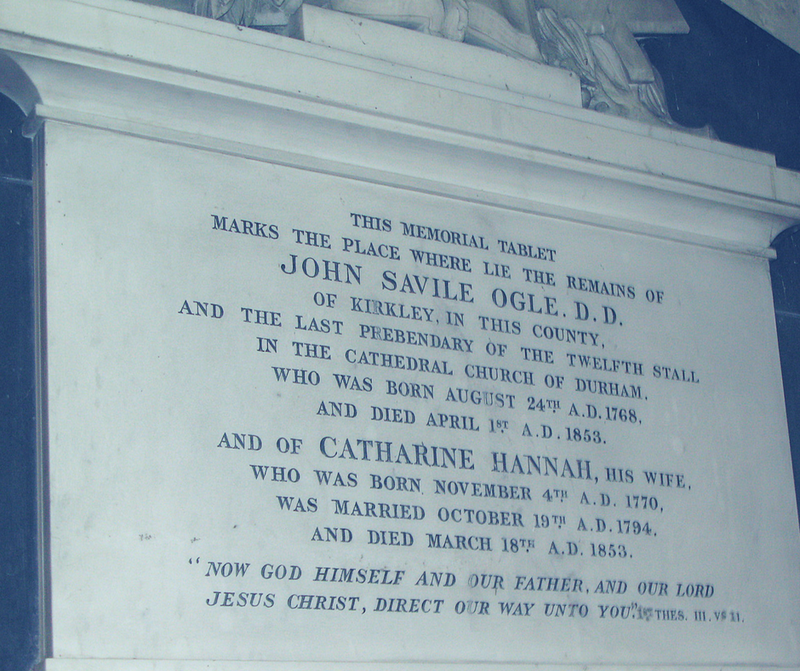 Another marks the burial of Sir John Ogle, Lancelot’s father, who died in 1566. 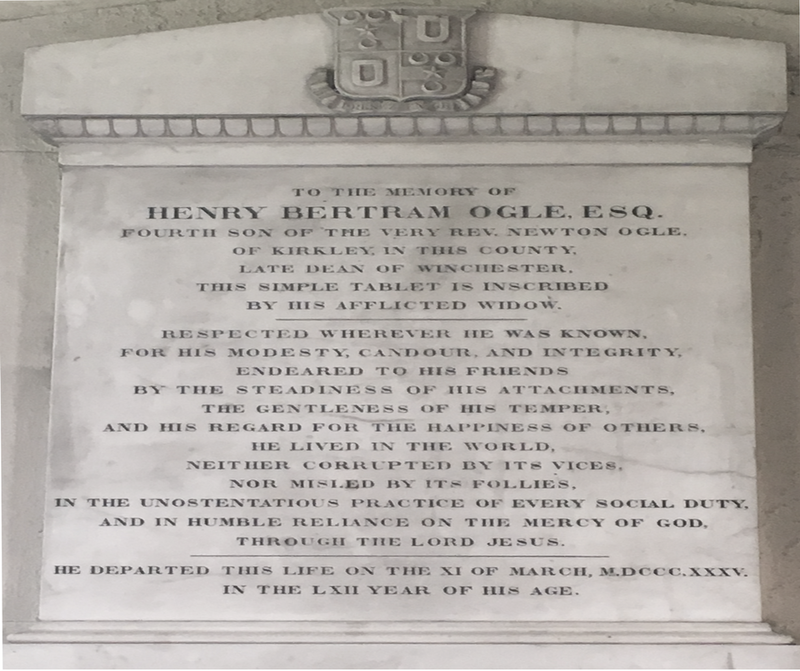 A third notes the burial of Henry Ogle in 1613. A stream runs diagonally under the Ogle chapel to exit the church near the main entrance. 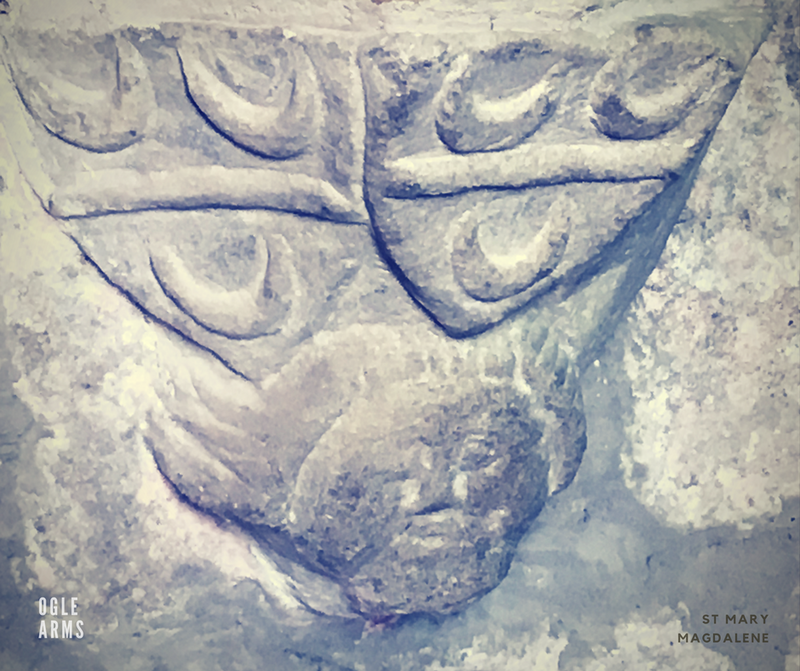 The clay pipe which contained it has crumbled over the centuries so that the vault under the chapel is now known to be flooded. 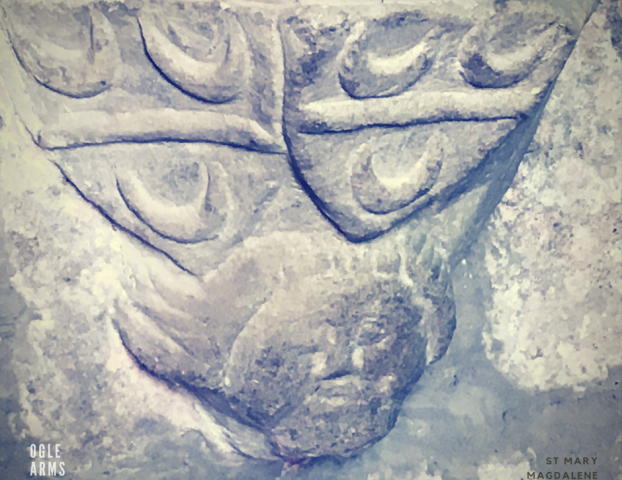 Ogles were laid to rest not only within the vault but outside in the churchyard immediately under the Ogle chapel window. 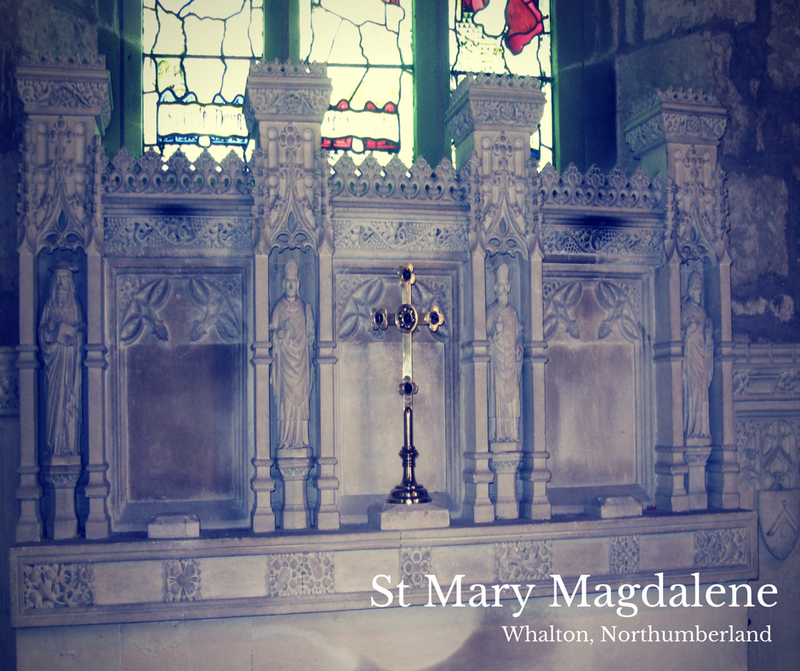 There are at various points within the church memorials to local men who fell in the Great War and World War II. 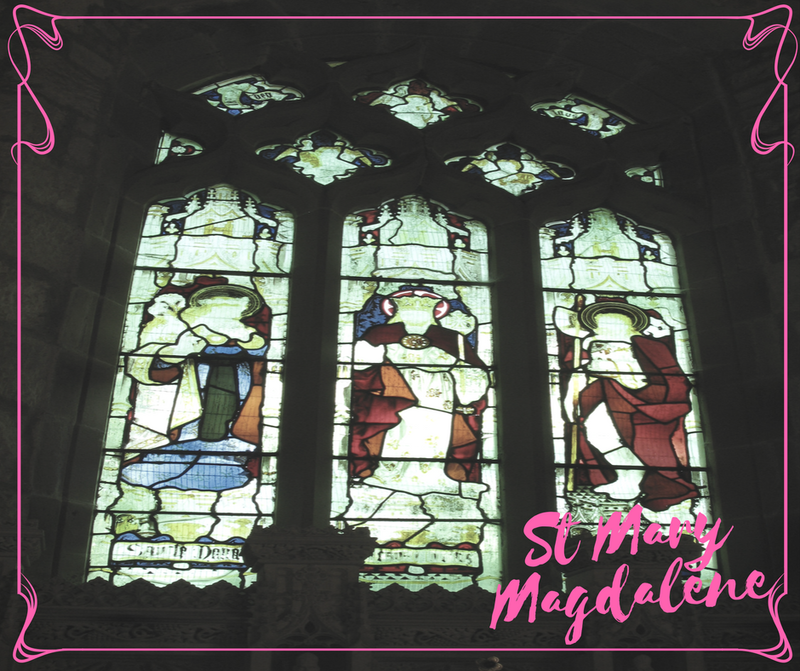 Until 1534 St. Mary Magdalene was a Roman Catholic church and until that date the interior walls were covered with paintings and texts as many of the worshippers would have been illiterate. 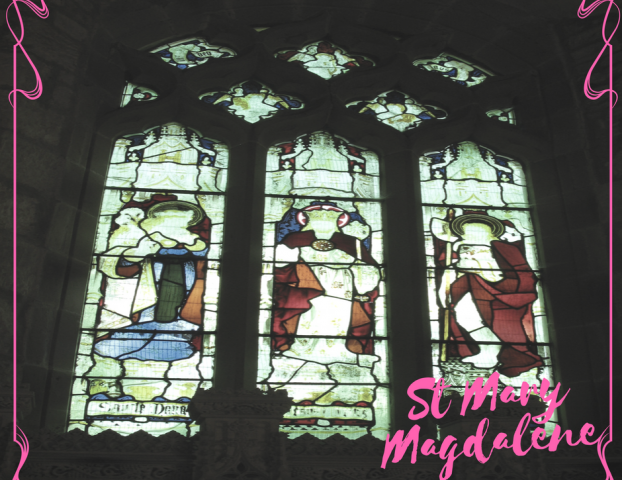 Apart from a small area of Latin text above the central bay of the north aisle these were removed by the strictures of the ascendant Protestants as were much of the stained glass windows and other adornments. 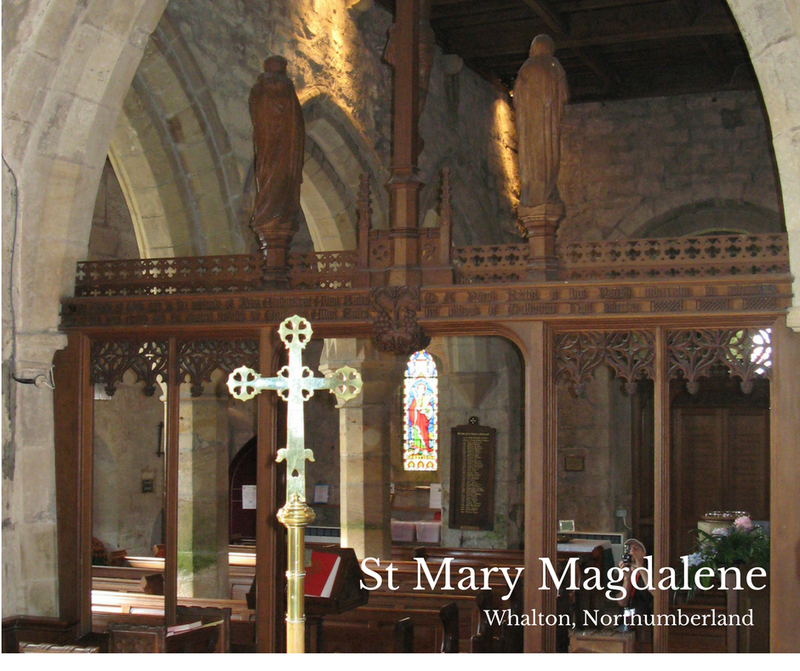 Historian George Robson guided O/OFA around St. Mary Magdalene church during our reunion in Northumberland. If any Society member is visiting Whalton freelance, he will be happy to attend and show you around. 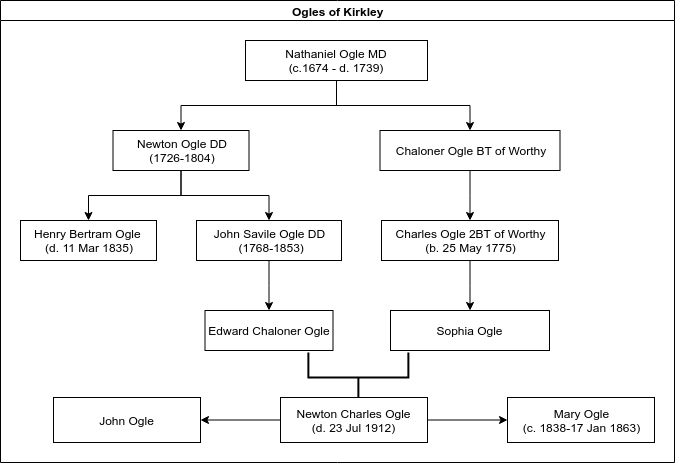 This entry was posted in Newsletter and tagged Kirkley, Northumberland family reunion, Ogles of Kirkley, St Mary Magdalene. Bookmark the permalink. Ogle Cousins, Wishing you all the joys a wonderful holiday season can bring. Happy New Year! Rev. 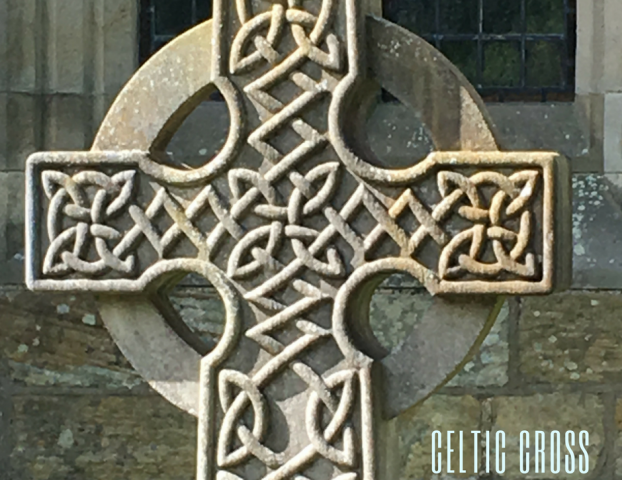 Joseph Lemen’s Grave (1785-1861) and the Old Lemen Family Cemetery were discovered on 11/29/18 by the O’Fallon Historical Society Cemetery Detectives, including our OOFA member, Tim Ogle. The cemetery was discovered on ½ acre of land off of Lemen Settlement Rd. in O’Fallon, St. Clair Co., IL, about 2 miles east of Bethel Baptist Church. The Lemen Cemetery is listed on an 1874 St. Claire County Atlas Plat map. The property was owned by Issac W. Lemen. Tim Ogle estimates about 15-20 undocumented graves can be found there. Rev. Joseph Lemen was an important historical figure in the early history of the state of IL. 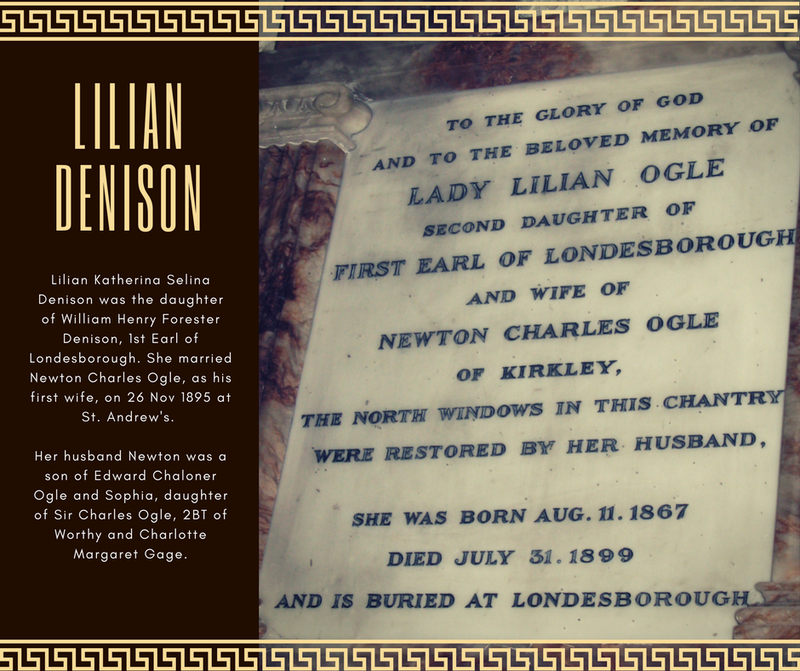 He was the son of Catherine Ogle and James Lemen Sr. and grandson of Capt. Joseph Ogle, noted IL pioneer and Revolutionary War officer. Rev. Joseph’s brother, James Lemen Jr. was a delegate from St. Clair Co. and signer of the 1818 IL State Constitution. Tim said Joseph’s headstone is one of the best preserved stones he has seen. Tim, along with other members of the Cemetery Detectives, cleared the overgrown brush and uncovered his stone buried under 8 inches of soil. Rev. Joseph Lemen took over as the pastor of Bethel Church after his father passed away in 1823. He organized many churches during his 50 years as a pioneer- preacher and covered areas from Kentucky to Iowa. 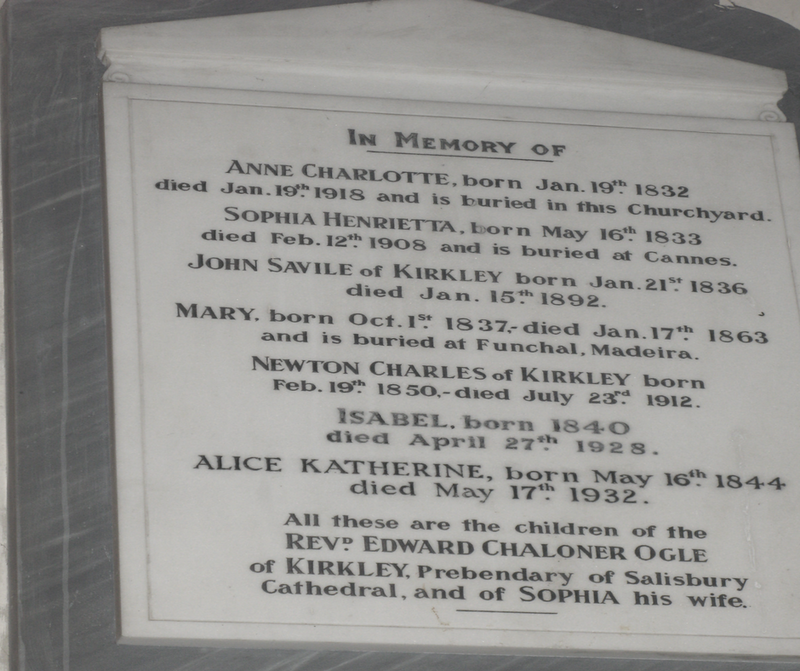 His wife, Mary “Polly” Kinney’s gravestone (1792-1863) was also discovered. Her brother, William Kinney, was the 3rd Lieutenant Governor of Illinois. Rev. Joseph and Polly’s sons, Joseph K. (1817-1895), James K. (1811-1884) and Robert C. (1823-1892) are also buried in the new found cemetery. Son, Joseph K. served as a Captain in the Mexican American War and served in the Civil War in the 63rd IN VOL, achieving the rank of Major. Thanks to the O’Fallon Historical Society Cemetery Detectives and Cousin Tim for finding and reporting this exciting new discovery!